Well, we're at it again....our work schedules had originally forced us to take some additional time off this month but then they backtracked on us and gave it back. 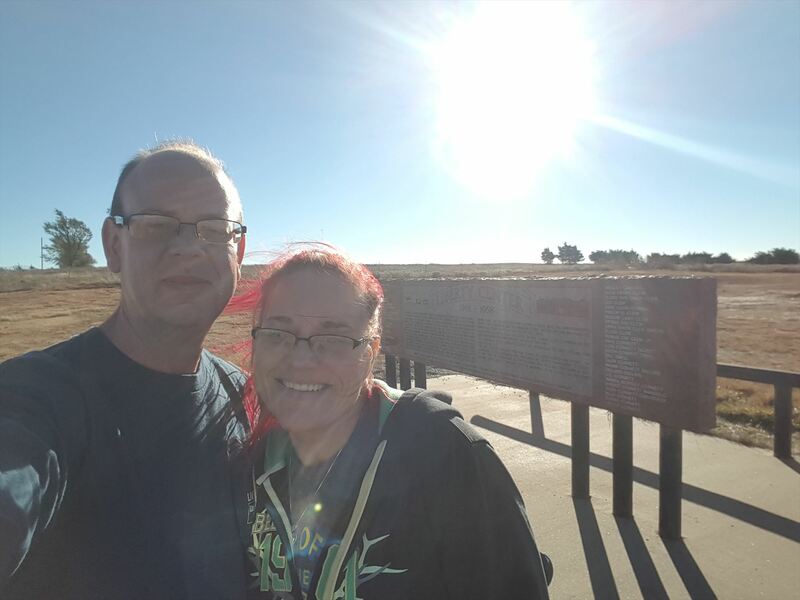 We had already planned to take advantage of the forced mini vacation so we decided to stick with our plans and our geocaching goals. We are visiting the area all the way from Lawrence, Kansas (home of the KU Jayhawks). Our goals for this trip are to light up all the counties on the Western half of Oklahoma and all the Texas pan handle counties by Thanksgiving, then hit the OK,NM,CO tri state border, nab one couny in NM and light that state on our map. We will finish up lighting up the the extreme Eastern counties in Colorado heading North until we hit I-70 to head home. We made camp in Ponca City to get an early start the first day and made it to our first geocache before first light. Day one was a success, despite Val feeling like she was coming down with something. We ended the day having lit up a total of 12 new counties, 7 on our OK map and 5 on our Texas map. We were even able to squeeze one more in than we were counting on getting yesterday. Day two was another great day. Val is was feeling better and we were able to finish out the 12 Texas panhandle counties we had planned. Day 3 we accomplished our goal of lighting counties along the way on a Southern route from Amarillo to OKC - we lit up 14 new ones yesterday and so far we are right on schedule. So far the actual geocaching mileage we have driven as of the start of this morning is: 1675 miles in 3 days! There is something wonderful to be said about watching the sunrise and the sunset with the person you love the most while spending the time in between traveling a road you have never traveled before. Our goals for the day are to cache across the SW portion of Oklahoma, lighting up new counties along the way then make our way back to our vacation rental in OKC, to make camp for the night and get up and do it all over again tomorrow. Log was soaked so we replaced it. Thanks for the quick p&g to light up a new OK County for us. This marks our 5th find of the day around 9:15am, on a sunny & windy 56 degree, mid-November, Tuesday early morning. TFTC and for our 5428th find from 310.5 miles away from home!